Yesterday the Boy Scouts of America voted to end their longstanding policy of excluding openly gay boys from their membership. They will continue to exclude LGBT adults from their leadership. You may recall that I wrote a pretty strongly worded post in opposition to this policy proposal back in April when it was first made public. I even bolded words to make them more angry sounding. In light of the decision, I reread that post this morning and have come to a couple conclusions. I concluded in the piece that the Boy Scout Council purposefully chose a half measure to feign an insincere interest in being more inclusive, but was actually trying to incite anger from progressive parents. According to my last piece, the BSA Council was doing this so that they could collectively shrug their shoulders and say "See we tried. We just can't reason with these people." I further predicted that the measure would be defeated. I was obviously wrong on at least one accord, and admittedly overreached on the other. The vote passed, and the BSA Council was most likely not trying to sabotage it. Looking at the 60% that voted for approval, I have to admit that they were most likely trying to save it. The BSA did extensive, private polling of their membership before writing the proposal. Now that I am a bit more calm, and have the gift of hindsight, I am inclined to believe that the BSA wrote a proposal they knew would not only pass, but would pass with enough of a margin to provide a mandate moving forward. So where does that leave us? Where does it leave the BSA? Where does it leave me and my boy? Well , this has been a pretty heated topic of discussion between my buddies and I since the whole thing began. And through multiple discussions with people I love, and whose opinions I respect (even when we don't agree on everything) here is where I've landed. This is a good thing. There is a reason that progress is the root of the word progression. It is a continuum, and the BSA has taken a noteworthy step. There will undoubtedly be an exodus of far right members of the BSA now, and it will most likely hurt the BSA. If we want to help save this organization and continue to support its progression towards full acceptance of LGBTQ people, then we need to step in and fill the void left by the far right folk who are leaving. As someone who has not always been a great friend to the LGBTQ community, I can honestly say that the best way to bring people over to our side is to get to know them and show how alike we all really are. So there you have it. I've caved a little since my last post, but my resolve stands strong to work towards the change that is right. For now, my boy will be a Boy Scout someday (if he wants to). Granted, they still have seven years to muff things up, but yesterday's decision, the one that had me fuming a month ago, now has me feeling a little more optimistic. 60% is a lot of percent. Now let's get the other 40! P.S. As always, feel free to tell me why I am wrong in the comments. I learn much more from considering that I may be wrong, than from always insisting that I am right. If you'd like to read my previous posts on this subject, they can be found here and here. I'm with you on a lot of what you've said, however, I'm not going to encourage my sons to be in the BSA until the policy is one of full acceptance mainly because the reason they say they are not letting adults in is to "protect" the kids. Protect them from what? As to imply that there is some higher rate of child abuse offenders (sexual or otherwise) in adults in the LGBTQ community. The only thing they are protecting is those who hold these unfounded beliefs by allowing them to continue to perpetuate such ridiculous ideas. The Eagle Scout they've been profiling in all the stories had a great point. While he was proud to get his Eagle Scout status before he turns 18, after he's 18 all the sudden he's someone to be protected from. What sense does this make? Luckily for me, my boys are still a few years off from scout age, and I hope that this is enough time for the BSA to change their policy to full inclusion because I truly did love my time as a scout. I just can't in good conscious encourage them to become a member of this group. My big question will be if they come to me at a young age and ask to be a scout, and I have to either wrestle with letting them join because to them its not about equality, its about scouting, or tell them no because of my opposition to the BSA positions (which they'll be far too young to fully understand). I agree wholeheartedly. Like I said, I have years before my boy can even be in Cub Scouts. I see this as a big step in a series of steps, but if we completely turn our back on the organization when they've now started to reach out, they're going to be ripped apart from both sides. I don't know... I'm still pretty torn on it, but I have come around to seeing this as progress. Good points. Changes still need to be made, I promise to keep fighting for them and pointing out the hypocrisy of allowing one and not the other until they do. What I'm saying is that there is enough good in the organization to give it some more time to come around. It is clear to me from the numbers on the vote that they knew that this would pass from their poling data. 60% is too far out of any +- margin of error. So if they new it was going to pass, then they must have been ready for some change. Their willingness to change this membership policy leads me to believe (maybe too optimistically) that they will be willing to change the leadership policy too. Time will tell. And admitting they're wrong won't be a PR nightmare when they are changing their mind to agree with the majority of Americans. That will be a PR win. BTW, thank you so much for commenting. I really appreciate what you're bringing to the conversation. We both obviously want the same thing and I understand where you are coming from. None of this is ever easy. Just keep writing and I'll keep commenting and we can keep the discussion moving forward! The new policy essentially boils down to the BSA teaching a generation of boys that gay men are not suited to be teachers or leaders. It is okay for a gay boy to learn how to start a campfire but not teach others the same skill. It was a cowardly action by an organization that would really rather not acknowledge that gay men are men first and gay second. Is there win here? 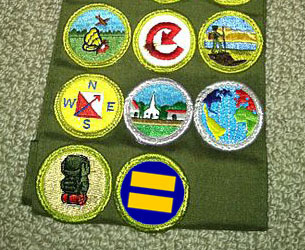 Sure - a gay boy can now participate in scouting. Assuming of course he keeps his mouth shut and doesn't aspire to do anything but follow the (straight) leaders. The BSA won't be teaching either way. The policy will imply it, which is wrong and needs to be changed. I will continue to be a voice that supports and encourages that change. I just have decided that I don't want to throw the baby out with the bathwater. I think there is enough good in the organization to work to cut out the bad - even if we need to do it piece by piece. Forbidding gay leaders denies young gay men the role models they desperately need. I don't think your optimism is misplaced - eventually the leader ban will be lifted. But when? 5, 10, 15 years? How many opportunities will be lost until everybody pulls their collective heads out? Giving the BSA a pass on this does nothing more then reset the clock. I agree, it's overall a good thing. But it's not enough. And I think it has to do with what expect from men in general. Have you heard the line, "Homophobia is the fear of straight men that other men will treat them the way they treat women?" I hadn't heard that. I think homophobia has it's roots in many things, all of which are cured by the recognition in one's self in the eyes of another - empathy. That is why I really do think this is a good step. Yes, there is continues exclusion, but there is also new inclusion. The inclusion of gay scouts will allow leaders and scouts to view them as so much more than "gay". That recognition and friendship is going to lead to more change than any boycott ever would. That's why I'm optimistic that the leadership inclusion will happen. "As someone who has not always been a great friend to the LGBTQ community, I can honestly say that the best way to bring people over to our side is to get to know them and show how alike we all really are." This is a great post. I respect your calm, thoughtful, and forward thinking approach. This vote was pivotal to the future of Boy Scouting, and it proved, the organization is capable of change. Change will come, the Scout motto promotes such actions. This will be new territory for the organization, to create policies and forge the way ahead. It's going to be difficult and rife with controversy, however, it will be done. I have given this topic several hours of thought, and upon introspect, this is a good thing. These boys are all growing into men. The intent of the organization is to make them into upstanding men and citizens. As such, they will need to learn tolerance and acceptance, and above all, grow above any fear or misunderstanding of their fellow citizens sexual orientations. I am done opining, bottom line, I agree, this was a great post. For some reason, I have an issue with enrolling my sons into an organization that specifically stipulates that I can't be the "best kind of citizen."